At the Library as Incubator Project, we work hard to highlight the many ways that libraries and artists can support each other, and not just because makerspaces are cool. We believe that creativity is inherent in everyone, and so we define "artist" broadly in order to communicate that point: to us, an artist is any person who uses creative tools to make new things. We think creativity -- like information --should be accessible to everyone in a community, and that the library is the perfect democratic space to make that happen. So, you're writing a children's book. How would you like $20,000 and free office space in a public library in order to help make that happen? That's exactly what The Children's Writer in Residence fellowship at Boston Public Library offers each year to an unpublished author, many of whom have relied on the library's fabulous collections to help them research and write their stories. 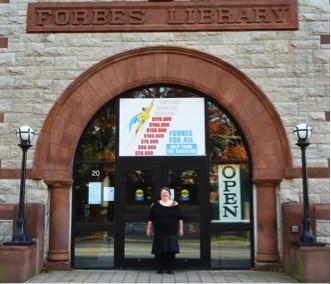 And it's not just large, metropolitan libraries that create space and support for writers -- the Writer in Residence at Forbes Library in Northampton Massachusetts enjoys in-depth research support from talented librarians who are well-versed in local history, plus the opportunity to lead writing workshops (and cemetery tours!) for the community. At libraries across the country and the world, these kinds of residencies are popping up in all sorts of incarnations, not least because they offer patrons the opportunity to meet and learn from an in-house expert. The Artist in Residence program at The Bubbler at Madison Public Library, for example, allows artists free reign over The Bubbler room, where they can work on their art, host workshops, and meet patrons who want to know more about what they do. Artists in these spaces often do incredible things to re-imagine the library as an information-finding experience, like visual designer and artist Chris Gaul, who served as Artist in Residence at the Library of the University of Technology, Sydney, where he conceived of "Book Babble," an installation involving a re-wired a set of headphones that picked up signals from books so that patrons could listen as they wandered the stacks and zero in on something interesting. Libraries don't just open their doors to artists to use the space-- they collect what they produce, too, and it goes far beyond purchasing the latest best seller. The Iowa City Public Library Local Music Collection was one of the earliest efforts to license music from local acts -- if you have a library card and password, and live in Iowa City, you can download full albums from the ICPL Local Music Collection. And you own it forever. The Yahara Music Library at Madison Public Library is modeled on the ICPL's incredible success, and takes it a step further: in addition to licensing streaming and downloadable content in multiple file formats, Yahara also integrates band bios, social media feeds, and news on upcoming shows, essentially providing a free advertising platform for local bands that allows music lovers to discover new music for free. And it's not just music. The IStreet Press at Sacramento Public Library not only has a suite of workshops that teach writing, editing, and marketing your work, it also leverages the library's Espresso Book machine, which prints books -- both public domain and patron-produced -- on demand, to build an impressive Local Authors Collection. When a patron decides to self-publish their work through I Street, they have the option to donate a copy to the library. The book is then catalogued, and added to the Local Authors Collection at the central library. The titles are included in the system's 28-branch catalogue as well, and are available to everyone with a library card in the area. Similarly, Provincetown Public Press is a new digital publishing imprint launched by Provincetown Public Library. Because Provincetown is an arts colony -- one of the oldest in the nation -- it made sense for the library to support the work of local writers. Add new, user-friendly platforms for producing e-books, and a juried selection process for choosing new titles to produce and sell on both Amazon and Apple platforms, and you have a new breed of publisher that can give voice to an artistic community: the Library. 3. Libraries show new artwork outside the gallery/museum circuit -- and that's a good thing. With their place at the center of the community and the free, democratic access people have to libraries, they make a perfect place to show art, in addition to helping artists make and distribute it. Showing work in a library is an opportunity to connect with a huge cross section of people -- little kids and seniors, the homeless and the well-to-do, students and businesspeople. Basically, everyone in the community -- including folks who might never see a modern art installation otherwise. And if the point of art is to make someone feel something, it's best to get it out there in the open where it can do it's job! 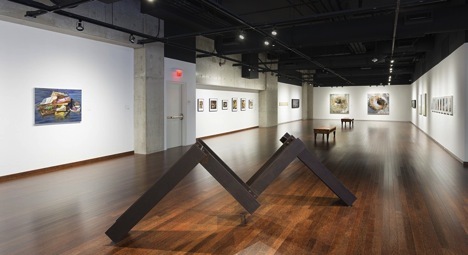 Libraries everywhere host local art shows on a regular basis, whether that means small exhibits in glass cases or hung in a reading room, or formal gallery space that can be customized, like the Art Gallery in the new Central location of the San Diego Public Library. On View at San Diego Public Library leverages this impressive new space to allow free access to the visual arts and cultural exhibitions, while promoting San Diego artists and creative community groups as part of their long-running and highly successful Visual Arts Program. 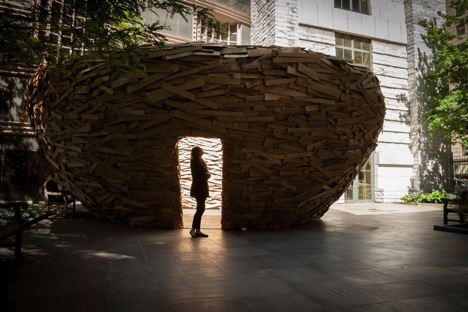 Libraries also tend to be big -- especially in cities -- big enough to commission large installations, like The Reading Nest. Each year the Cleveland Public Library has an open call to artists to execute a temporary installation in their Eastman Reading Garden, and in 2013, artist Mark Riegelman won the commission and created The Reading Nest using discarded wooden boards. The final work stands approximately 13′ tall and 36′ wide, and was inspired by the Eastman Garden's feeling of refuge within downtown Cleveland and symbols from the natural world that we often associate with knowledge and wisdom: trees and owls. "I want visitors to be enchanted by the installation. I want them to feel like they are walking into a fairytale," Riegelman said of The Reading Nest, and we think he pulled it off: the effect of the piece is not unlike cracking open a good book! In the same way that libraries can connect a huge cross section of people with new and exciting artwork, they can also open up the world of theatre and performance to folks who may not usually go to see a production. The BONK! Performance Series at Racine Public Library, for instance, started out as an independent project run by poet and librarian Nick Demske before migrating to a permanent home as under the Racine Public Library umbrella. The series aims to bring challenging poetry, art, and performance to the established local arts community in Racine -- a place you might peg as an unlikely place for an avant garde performance series to thrive. And yet, BONK! now has a huge following in the area and has garnered national attention on the American poetry scene. It regularly hosts poets and performers like Ching-In Chen, Amaud Jamaul Johnson, and S.E. Smith, bringing their work to an unexpected and enthusiastic audience. Likewise, the Page to Stage performance series at Princeton Public Library is an exercise in minimalism and creativity for theatre artist Brandon Monokian. Several years ago. Brandon and a group of theatre artists adapted readings from Revolutionary Voices: A Multicultural Queer Youth Anthology and performed them around New York and New Jersey. The success of their performances caught Programming Librarian Janie Hermann's eye after she booked their show at the Princeton Public Library for Banned Books week, and invited him to develop more performances for the library. They collaborated to create the Page to Stage series, which features staged readings of plays that have been adapted from or inspired by literature, including Einstein's Dreams, Grimm Women, and The Arabian Nights. Brandon never imagined that he'd be creating performances for spaces other than a theatre, but now he's sold. The spatial and technical limitations at the library not only challenge him creatively -- for one production, the play called for a river onstage, which Brandon interpreted as a collection of recycled water bottles -- but also stretches the use of the art. "Tying live theatrical entertainment to literature serves as an animated way to promote literacy,"Brandon says. He believes that doing theater in a library can be an important political statement in addition to a creative collaboration. 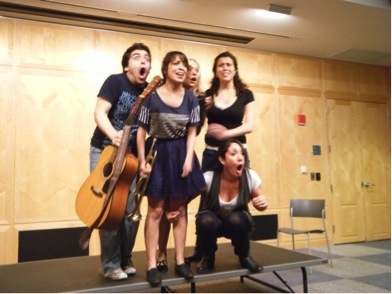 Page to Stage program at the Princeton Public Library. Photo by Kaitlin Overton. So you can see art and performance in a library, and you can use the space to help produce and promote your music and writing and artwork, but what if you're a dabbler, a hobbyist looking to try your hand at something new? Well, you're in luck, because this is the library's primary wheelhouse (in addition to books and other materials, of course). Even if your library doesn't have a fancy gallery space or an artist-in-residence, its mission to be a locus for lifelong learning, and that means it probably has a robust calendar of hands-on programs that can help you get a taste of a new skill or subject. From computer applications to coding, digital photography to embroidery, screenprinting to storytelling, libraries leverage the experts in the community to offer many free tutorials on a variety of interesting activities and skills. 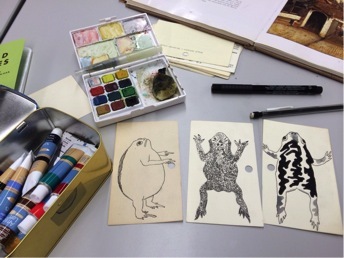 When you combine these hands-on explorations with the classic library book club, you have the recipe for a unique literary exploration, which is exactly what The Book to Art Club sets out to achieve. Carrying out the Book to Art motto, "Read, Talk, Make," chapters at libraries all over the country add a creative twist to the standard book discussion that is a popular library staple. Book to Art meetings aren't just a place to discuss the narrative, characters, or style of a particular title, but also invite participants to create something new in response by riffing on themes, ideas, and settings in a text through simple art projects that can be customized for any skill level. Thinking visually in this way opens up some exciting discussions that would never come up otherwise. The Madison, WI chapter of the Book to Art Club meets at The Bubbler at Madison Public Library, but any library is welcome to download the Book to Art Club's free templates and project suggestions for such titles as The Interestings by Meg Wolitzer, The Evolution of Calpurnia Tate by Jacqueline Kelly, and Markus Zusak's The Book Thief. Erinn Batykefer is co-founder of The Library as Incubator Project along with Laura Damon-Moore. The LAIP is based in Madison Wisconsin but lives online here. Follow the team as they write about libraries + art stuff on Twitter, Facebook, and Pinterest. And, be sure to check out their new book, The Artist's Library: a Field Guide from the Library as Incubator Project [Coffee House Press, $23.95].